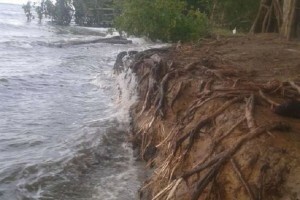 BALFATE – In Balfate, a rural municipality that includes fishing villages and small farms along Honduras’ Caribbean coast, the effects of climate change are already felt on its famous scenery and beaches. The sea is relentlessly approaching the houses, while the ecosystem is deteriorating. On March 9, Environment Minister José Antonio Galdames launched the Climate Agenda, which outlines a National Plan for Climate Change Adaptation for the country, whose implementation recently began to be mapped out. Among the measures to be carried out under the plan, Galdames underscored a project of integral management of the Motagua River basin, which will include reforestation, management of agroforestry systems and diversification of livelihoods at the productive systems level.